Here at Acoustic Frontiers we use these five acoustic design techniques to create amazing bass. Bass that is tight, articulate, defined, impactful and even. Most people have not heard just how good bass can be when the room is taken out of the equation. For new build dedicated listening rooms, home theaters or studios the first step is to optimize the length, width and height of the room. This ensures that room modes are well distributed and do not stack on top of each other. There are a few different dimensional ratios that work including Bolt, EBU and IEC. Trevor Cox’s graphic summarizes these recommendations in an easy to use format. 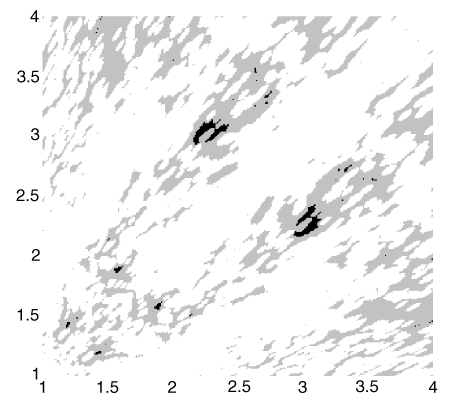 Darker areas in this graph represent best room dimensions, and the ratios are normalized to the room height. For example a room with an 8′ ceiling, a width of 12′ and a length of 16′ would have a ratio of 1:1.5:2. The best ratios cluster around 1:2.2:3 which for an 8′ ceiling would mean 17.6′ width and 24′ length. It’s important to realize that dimensional optimization is only one of the five steps to amazing bass. A room with “perfect” dimensions will still have room modes! Small room LF design dimensions or ratios? “In its basic form Invisible Alpha© refers to the low frequency absorption component of a wall or other hidden absorber.” See here. The acoustical mechanism by which walls and ceilings absorb sound is quite simple. Sound energy excites the shell into motion. The mass of the shell and the depth of the air cavity form a resonant system. The motion is damped by frictional losses in the material that the wall is constructed of. Floppy wall under construction. This one will have a single layer of pre-fabricated damped drywall. Note the wide spacing of vertical studs. Here at Acoustic Frontiers we use the term “floppy wall” to denote these lossy walls. The absorption frequency can be tuned by changing the mass of the wall, the method of attachment to the structural framing members and the depth of the air cavity. Even if you don’t have the space or budget for a floppy wall then at least use damped drywall. Damped drywall is useful because its resonances are subdued relative to those seen in normal drywall, which tends to vibrate at around 60Hz. As in if you energize the room with a 60Hz note the drywall will keep on ringing (making sound) after the note has stopped. 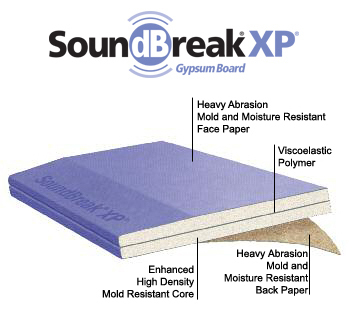 Double or triple thicknesses of drywall with a contractor applied constrained layer damping compound like Green Glue are typically specified for sound isolation but a single 5/8″ layer of pre-fabricated damped drywall works great as one component of a floppy wall system. 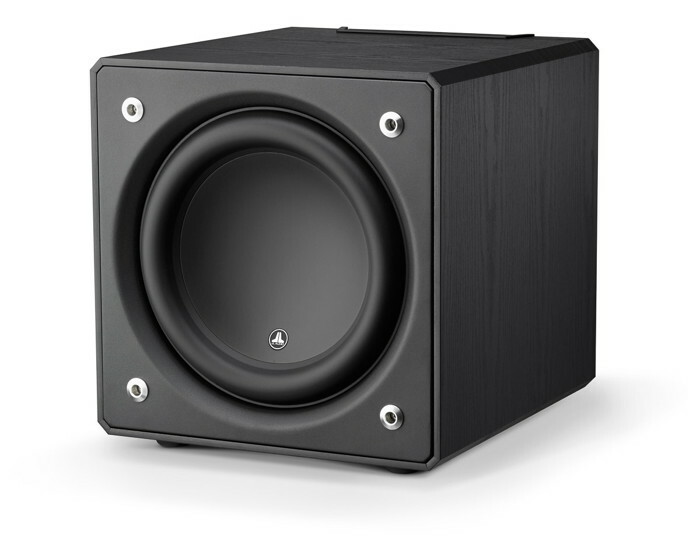 The next weapon in our acoustic design armory is multiple subwoofers. Some people think multi-sub approaches will fix all bass issues. That is not true for a simple reason. The region where room modes dominate the frequency response extends at least to the transition frequency, which is around 250Hz. Although Steinway-Lyngdorf would beg to differ everyone else limits subs to the generally accepted practice that bass is non-localizable below 80Hz. So that still leaves the region between 80Hz and 250Hz, which means you need passive acoustic treatment. Multi-sub approaches work by preventing room modes from existing in the first place (room mode cancellation) and by filling in speaker boundary interference related cancellation dips. There are different approaches to setting up and optimizing multi-sub arrays. In new rooms locations and required signal processing (levels, delays) can be modeled using boundary element techniques. In existing rooms a trial and error approach is best employed after analyzing the room acoustics, determining the room mode frequencies and working out which room modes can be cancelled through sub placement. For example in an existing room if there is a 1st axial length mode at 34Hz then we know that if one sub is placed in the front half of the room and one in the back half that the room mode will be driven destructively. More here. Most people think that if they have room acoustic issues in the bass then acoustic treatment – stuff they add into the room after it is built – is the only option. Hopefully by now you understand that there are many other tools to get amazing bass (and we haven’t even gotten to EQ yet!). If the heavy lifting in the sparsely populated room mode region has been done through proper shell design and multi-sub arrays then acoustic treatment can be focused on the region above 80Hz. This makes life a lot easier because a lot of commercial bass traps are only really effective down to about 70Hz. Bass traps should be located where they are most effective. Presuming the use of pressure based devices then this means intersections of two (e.g. wall / wall corner ) or three (e.g. wall / wall / ceiling tri-corner) boundaries. Sound pressures are also closest nearest to sound sources like speakers and subs. See our article on bass trap placement for more. The best commercial bass traps we have found are the RPG Modex Plates. 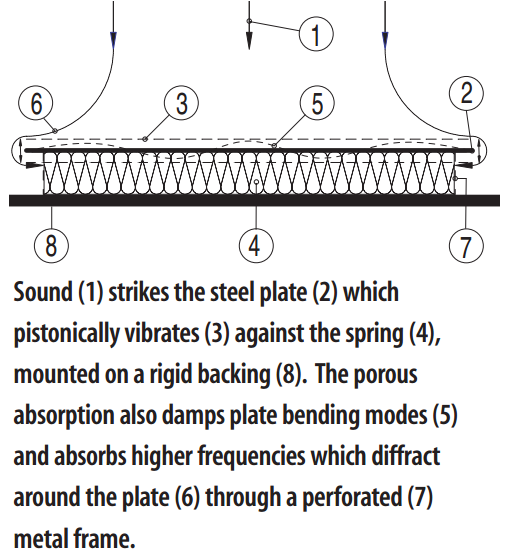 These incorporate a thin steel plate and are available in three versions depending on the frequency ranges that need absorption. At only 4″ thick there is nothing better out there. 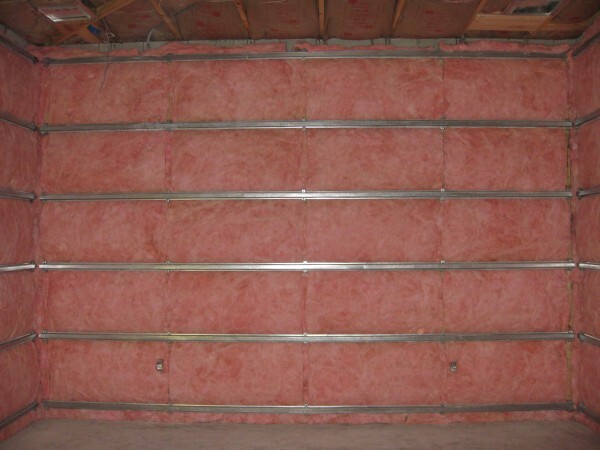 If you have more space (8″+) and are willing to build then you can make some very effective acoustic treatment (we typically recommend detuned Helmholtz resonators or very thick pink fluffy traps) from lumber, sheet goods and building insulation. I’d like to recommend some further reading but a lot of it is from acoustic treatment companies trying to sell you product. Bass traps 101 – a pretty good guide from Tim @ Arquen. There is a reason why we put room equalization last. It should be the icing on the cake, not the cake itself! Don’t start with EQ, add it once you have employed as many of the other tools that you can. With that said, room EQ is exceptionally good at dealing with room mode resonances. 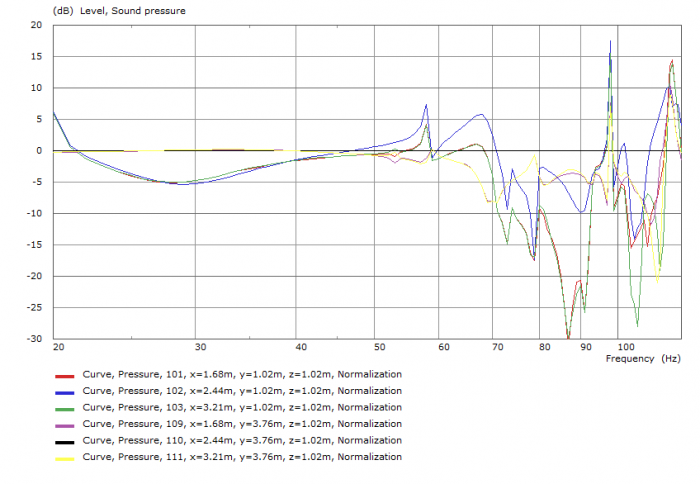 You can easily cut a problematic resonance at say 30Hz by 10dB or more. That kind of adjustment would be would be extremely difficult to achieve using passive acoustic treatment. It’s worth noting that room EQ has some drawbacks which you will see frequently mentioned (mostly by people trying to sell lots of acoustic treatment…). “Room EQ cannot fix dips”. That statement has some truth in it. EQ cannot fix speaker boundary interference dips because those are phase cancellation related – increase the direct sound and the indirect, reflected sound increases by the same amount. However if you have a dip due to a natural gap between room modes (which often occurs under 100Hz) then you can boost that. “Room EQ makes the response better in some positions and worse in others”. Again there is some truth in that, but only if you are not using multi-sub arrays and have little bass trapping in your room. Properly placed subwoofer systems actually reduce spatial variance in frequency response, as we have shown in our multi-sub case study. Basically if you have used the other four techniques then you might only need one or two bands of EQ below 100Hz to get the room really flat. Why can’t I fix all my acoustic problems with EQ? In my experience in a well designed room (with convex sidewalls specifically to reduce lateral bass standing waves), the location of a central sub crossed at 90 Hz is clearly audible on orchestral recordings where the contra basses are pretty hard right, such that I’ve never considered using a central single sub, regardless of the maximum room mode excitation aspect. I don’t think Lyngdorf is alone in thinking this. Thanks for your comments. I’m intrigued by convex sidewalls…I can’t think I’ve ever seen a room with convex sidewalls, maybe you can send me a link? Even heavily splayed side walls and circular rooms still have room modes. It’s a bit of an fallacy to think splaying walls reduces room modes. The room was my own design with side walls having a 14′ radius. This wall was framed with 2X4s and achieved substantial stiffness (did not boom when thudded with a fist) purely through the curvature, since the skin was 1/4″ tempered hardboard. Multiple curved shelves screwed to the wall from behind provided additional rigidity. The front wall was almost entirely wide band absorbent, being formed of a second false wall in front of the real wall with an almost floor to ceiling and wall to wall aperture in which two layers of 4″ fiberglass were hung with an inch or so between them and behind the rear one. You could play a sine wave at almost any bass frequency in that space and walk around the room and hear almost no significant changes anywhere, certainly no obvious nulls or build ups. The bass sounded more or less the same at the mixing position or at the client couch behind. I wish my current space was as good! Circular spaces have massive modes. Interesting room design, I’d love to model that in my boundary element program and see what happens. As long as a bass wavelength fits in a room there will always be standing waves of some kind. The design of the walls and bass trap at the front of the room may have added significant damping, which is why the bass was quite even and flat. Toole’s discussion of room dimensions (and listening positions therein) is rather compelling – the essence being that one can’t determine ‘optimal’ dimensions independently of a particular sub configuration and listening position (e.g. centre versus 1/3). The frequency range that is room mode dominated stretches way above the frequency range subs are normally used in, so room dimensions are important to minimize stacking. Good room dimensions are also important to minimize the gaps between room modes in the sparsely populated room mode region below 100Hz. It’s very hard to get really good bass in a room with poor room dimensions, like a square room. Is the floppy wall, covered by the double layer of drywall or does it need to be covered by acoustic fabric? Thanks.